I was sitting in my dad’s RV with a glass of wine he’d just given me. He held a Cabernet Sauvignon as well and relaxed in a small lazy boy swirling his glass. He and my mom were visiting from Henderson, NV, and they had set up the rig at their favorite RV park in Bakersfield, CA. As we sat, my wife and mom chatted in the back bedroom as my daughter jumped on the mattress. (My son, Luke, was not yet born.) My dad looked back at the room from time to time, trying to catch a glimpse of my daughter laughing. “I’m almost done with Gilead,” he said. I nodded, glad he was reading it. I bought it for him because almost every page of the book made my heart ache as both a son and father. 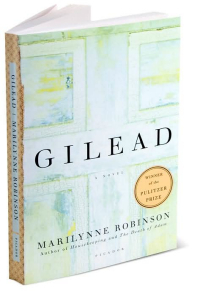 Gilead is simply one of the best books I’ve ever read, and I wanted him to read it. He took a sip and looked out the window at the nearby restaurant connected to the park’s office. He nodded, and we began discussing something else. If I remember correctly, we never talked about the book again. My dad passed away on June 4th of this year, one day before his 70th birthday. This was a surprise. He had fallen back in 2008, and his death was ultimately a result of this accident. There are no words to express the emotion one feels upon losing a parent. I’ve chosen not to write about it or even speak about it very often because I don’t know what to say. The experience has not left me with any epiphanies. To process the loss, I took the pragmatic route early on of helping my mom and tending to her emotional needs in any way I could. In doing this, the things I thought about were the seemingly mundane. I stared at the sandals he had taken off near his golf bag. They were in the same position they had rested when he kicked them off–near each other and pointing toward the garage door. His yard tools hung crookedly on the rack where he left them. Inside the house, his dirty clothes lay in the hamper. The bottle of port remained half full near the stove. His keys rested on the top of his dresser, right where he had placed them after my mother and he had gone shooting in the desert outside Primm earlier that day. And Gilead rested on his book shelf. I wouldn’t look at the book the two weeks my wife, kids, and I stayed with my mom. I remembered the conversation in the R.V. with my dad while we rushed to his house in a failed attempt to see him before he passed. Many things passed through my mind during that drive. The day after the funeral, right before my wife and I drove back home, I walked to the bookshelf and grabbed the book. I didn’t open it. Upon returning home later that night, I still didn’t open it. I knew the book very well, and from time to time I’d wonder which passages he underlined and what he possibly wrote. When a few weeks passed, I finally wanted to take a look. I picked up the book and opened it. I’m going to write a number of posts over the next couple months about the sentences and paragraphs he marked. He didn’t write much, but he did do some underlining. I won’t write exclusively about this, but I’d like to throw a post about the book into the ether from time to time. Gilead has always been very special to me. I’d like to share it here because the story is precious and I believe it can benefit those who choose to share in the experience. Also, my dad liked reading my posts on this website, and I think he would have enjoyed reading a discussion about his favorite parts of Gilead.